Julia Ruth Stevens threw out the first pitch at Fenway Park on July 9, 2016, for her 100th birthday. “The Curse” brought about by Babe Ruth’s departure from the Red Sox became an enduring part of baseball lore, but his oldest daughter would have none of it. Mrs. Stevens, Ruth’s last surviving child, was 102 when she died in her sleep Saturday in an assisted living facility in Henderson, Nev., her only child, Tom Stevens, told the Globe Saturday. “She was the last authority on Babe, the man,” he said by phone from his home in Nevada. Nevertheless, she didn’t like to tempt fate. In 1995, Boston finished first in the American League East, only to lose to Cleveland in the Division Series. Mrs. Stevens, he added, “was thrilled” when the Red Sox won the World Series in 2004, breaking an 86-year drought. Babe Ruth played the first six seasons of his career in Boston, where he was a standout pitcher. 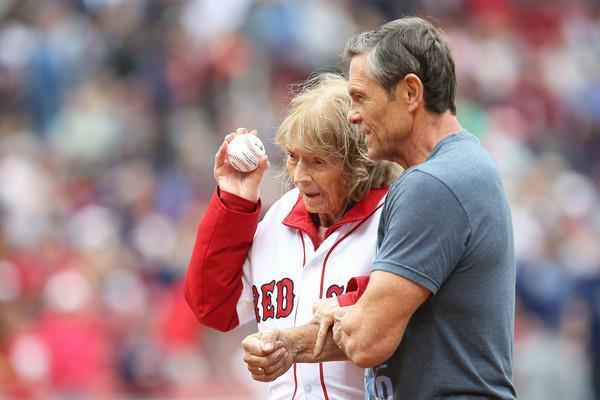 “I’d say my father was equally as proud of the 29⅔ shutout innings he pitched in the World Series as the 60 home runs,” Mrs. Stevens told the Globe in 1993 of her father’s mound performance for the Red Sox in 1916 and 1918 championships, which was a record for many years. In 1919, Red Sox owner Harry Frazee famously sold Babe Ruth’s contract to the New York Yankees, which helped set in motion one of the most famous rivalries in sports history. It also led to the theory that sending Ruth to the Yankees cursed the Red Sox to languish for decades without winning the World Series. Julia Ruth Stevens with her parents, watching the Giants beat the Yankees during the first game of the 1936 World Series. Born in Athens, Ga., on July 17, 1916, Julia Hodgson was the daughter of Frank Hodgson and Claire Merritt. When Claire Ruth died in 1976, the Globe noted that her family had other baseball connections. Claire’s father was a lawyer who had represented Hall of Fame hitting legend Ty Cobb. Her cousin was slugger Johnny Mize, another Hall of Fame player. Julia was young when her parents separated. Claire moved to New York City, where she was introduced to Babe Ruth. His first wife, Helen, had died in a house fire a few years after they separated. Ruth married Claire in 1929. He adopted Julia and the couple raised her along with Dorothy, his adopted daughter from his first marriage. Dorothy died in 1989. 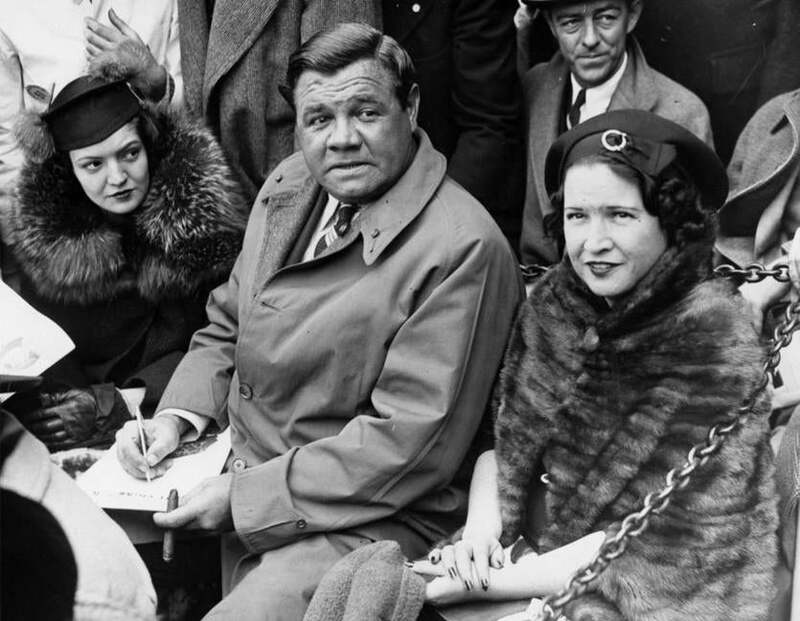 In a first-person account for the Globe in 1959, Claire wrote that when Julia graduated from high school in New York in 1934, Babe Ruth flew back to New York from a Yankees road trip to St. Louis to attend the ceremony. Claire said her husband also flew home from his baseball duties a few years later when Julia was ill. “He gave Julia a blood transfusion that saved her life,” she recalled. While on a golf trip with her father to North Conway, N.H., Julia met Richard Flanders. They married and she helped him run the Cranmore Mountain Lodge. After he died several years later, she ran a general store in Eaton Center, N.H., and met Grant Meloon. They married and had a son, and their marriage later ended in divorce. She subsequently married Brent Stevens, a poultry farmer. They had been married for 49 years when he died in 2004. He had been a Red Sox fan, and she told the Globe that she switched her baseball loyalties from New York to Boston in the mid-1990s, when Brent stopped rooting for Boston — he decided he couldn’t let the Red Sox break his heart again. “It was about that time that I took up for them,” she recalled in 1999. They often traveled to baseball appearances including at Fenway Park, which she last visited on July 9, 2016, to throw out the first pitch at a Red Sox game just before she turned 100. “It was all about the kids for Julia and continuing her father’s name,” Brill said. A date for a service to be held in Conway in the spring will be announced for Mrs. Stevens, who in addition to her son leaves two grandchildren and four great-grandchildren. Tom Stevens said his mother will be buried in Conway, alongside her late husband, Brent. Burial will take place once the ground thaws, he said, around the start of the baseball season. In interviews with the Globe, Mrs. Stevens spoke of the side of her father fans rarely saw. She recalled that her father also “taught me how to dance. He was a beautiful dancer, he really was. Believe me, when I was a teenager, there was nobody I’d rather dance with than my father.” “I just wish other people could have known him as I knew him, because he was such a caring, loving father,” she said. Bryan Marquard of the Globe staff contributed to this report. Maddie Kilgannon can be reached at maddie.kilgannon@globe.com.